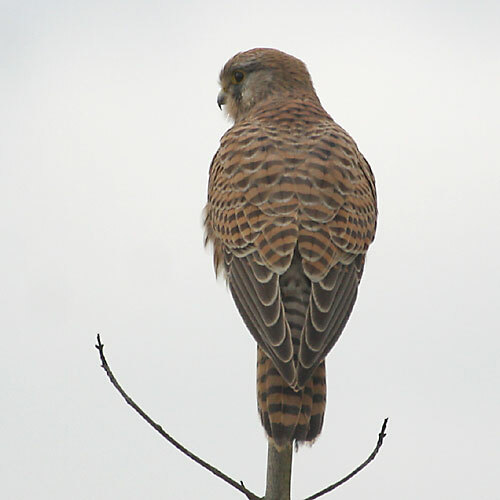 The Kestrel is the commonest daytime raptor in Europe. It is found throughout most of temperate and tropical Europe, Asia and Africa. telegraph poles, buildings, etc. on which it can roost. then pouncing on its prey. The male has a grey head and tail while the female show a brown head and has a barred tail. and it wasn't alone either,at a time as many as 5 of them flew around there. but it seemed like they already had begun their flirtation - and then the sound was different. close-knit group of similar falcons often considered a subgenus Hypotriorchis. evenings. While on migration, they may move in small groups. white, thighs and undertail coverts are unstreaked rufous and rest of the underparts are whitish with black streaks. Close views enable the red "trousers" and vent to be seen. Sexes are similar. 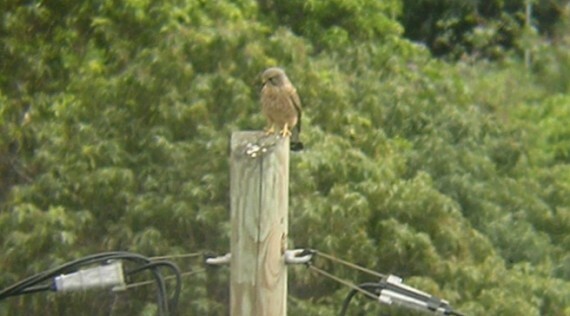 Juveniles are generally much browner, with scaled upper parts and streaked buffy thighs and undertail coverts. wings and square tail, often resembling a swift when gliding with folded wings. It flies powerfully and fast. slowly in circles. It also captures small bats and small birds like swallows, swifts, pipits etc. in flight. extreme edge of a spinney, whence the bird can observe intruders from a considerable distance. 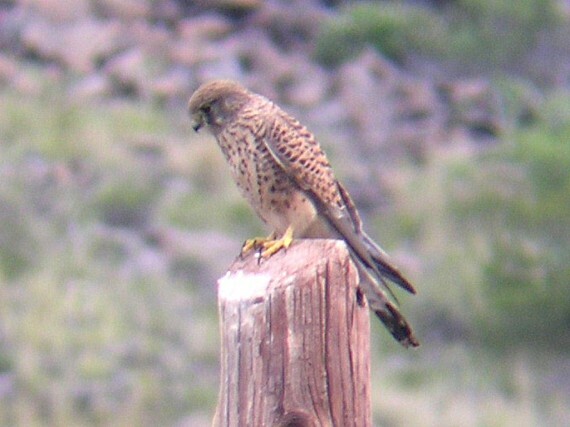 The Merlin, Falco columbarius, is a small species of falcon from the Northern Hemisphere. Holarctic; some migrate to subtropical and northern tropical regions in winter. size needed to feed a mated pair. 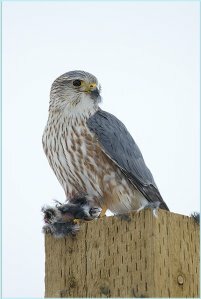 The male Merlin has a blue-grey back, ranging from almost black to silver-grey in different subspecies. Its underparts are buff- to orange-tinted and more or less heavily streaked with black to reddish brown. The female and immature are brownish-grey to dark brown above, and whitish buff spotted with brown below. Besides a weak whitish supercilium and the faint dark malar stripewhich are barely recognizable in both the palest and the darkest birdsthe face of the Merlin is less strongly patterned than in most other falcons. 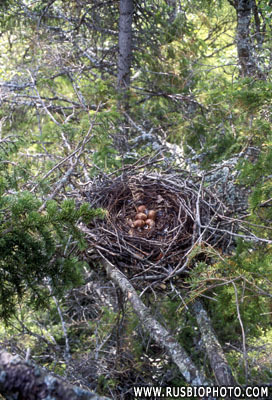 Nestlings are covered in pale buff down feathers, shading to whitish on the belly. The first modern taxonomist to describe the Merlin was Carl Linnaeus, a Swede who reported his type specimen came from America. Thirteen years after Linnaeus's description Marmaduke Tunstall recognized the Eurasian birds as a distinct taxon aesalon in his Ornithologica Britannica. If two species of Merlins are recognized, the Old World birds would thus bear the scientific name Falco aesalon. Canada and northernmost USA east of Rocky Mountains, except Great Plains. Migratory, winters in S North America, Central America, the Caribbean, and N South America from the Guyanas to the northern Andes foothills. Rarely winters in the northern USA. Great Plains from Alberta to Wyoming. Resident (some winter dispersal). Pacific coast of North America, from S Alaska to N Washington state. Resident (some altitudinal movements). 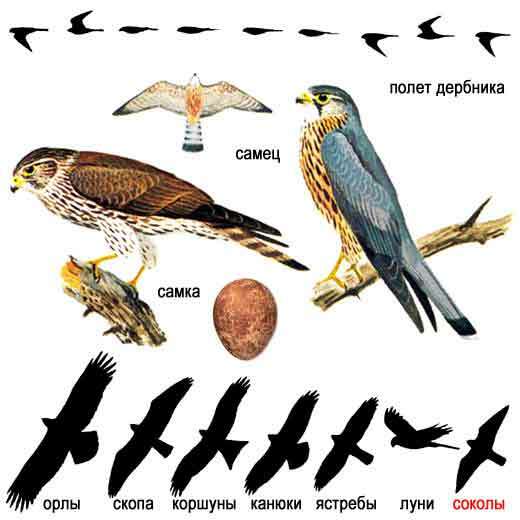 Falco columbarius/aesalon aesalon, Northern Eurasia from British Isles through Scandinavia to central Siberia. Population of northern Britain shows evidence of gene flow from subaesalon. British Isles population resident, rest migratory; winters in Europe and the Mediterranean region to about Iran. Iceland and Faroe Islands. Latter population has some gene flow with aesalon. Resident (some winter dispersal). 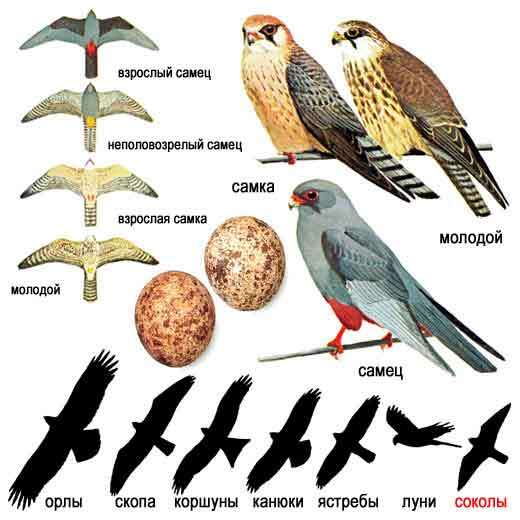 Falco columbarius/aesalon pallidus, Asian steppes between Aral Sea and Altay Mountains. Migratory, winters in S Central Asia and N South Asia. Siberia between Yenisei and Kolyma Rivers. Migratory, winters in continental East Asia. 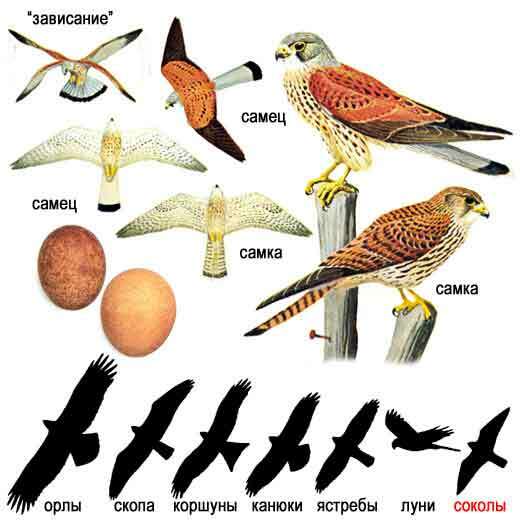 Falco columbarius/aesalon lymani, Mountains of eastern Kazakhstan and surrounding countries. Short-distance migrant. 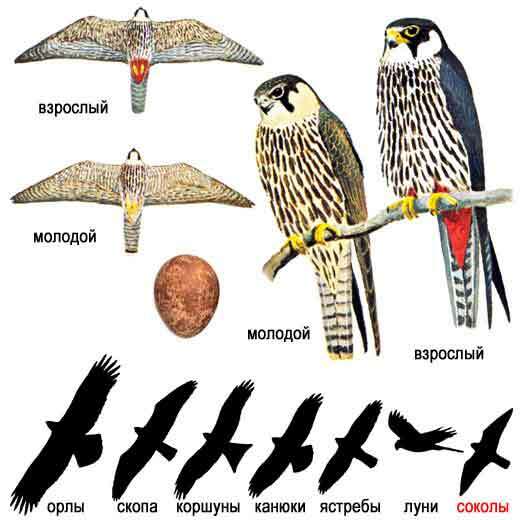 Falco columbarius/aesalon pacificus, Russian Far East to Sakhalin. Migratory, winters in Japan, Korea and nearby. The Red-footed Falcon, Falco vespertinus, formerly Western Red-footed Falcon, is a bird of prey. numbers are dwindling rapidly due to habitat loss and hunting. 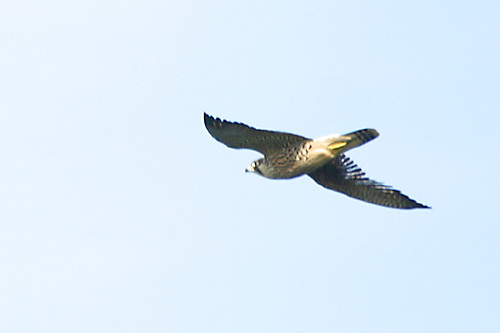 Falcon was found in North America for the first time on the island of Martha's Vineyard, Massachusetts. and a white face with black eye stripe and moustaches. Young birds are brown above and buff below with dark streaks, and a face pattern like the female. Red-footed Falcons are 28-34 centimetres in length with a wingspan of 65-75 centimetres. This is a diurnal bird of open country with some trees, often near water. 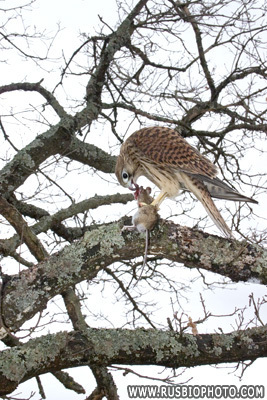 Its distinctive method of hunting is shared by the Common Kestrel. It regularly hovers, searching the ground below, then makes a short steep dive towards the target. 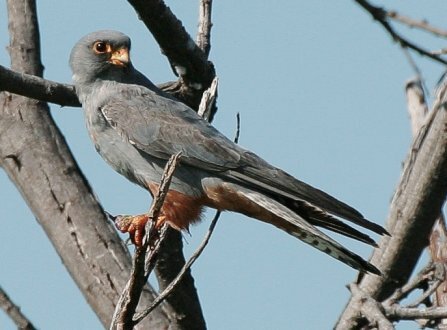 The Red-footed Falcon's main prey is large insects, but it will also take small mammals and birds. 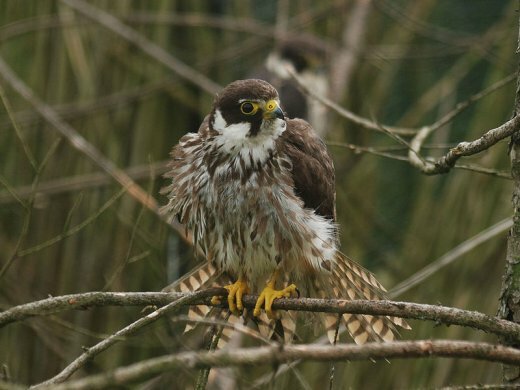 This falcon is a colonial breeder, reusing the old nests of corvids, such as Rooks. It lays two to four eggs.